Attorney Antzoulatos is a longtime public defender, staff attorney in Suffolk County Superior Court, and Co-Chair of the NLG-Mass’s Mass Defense Committee. As a public defender for the last ten years, Antzoulatos has provided criminal defense services to folks in the Boston area. Attorney Medina is a public defender at the Committee for Public Counsel Services (CPCS) and represents clients in the Roxbury and Dorchester district courts. In addition to her case load, Erica is also the co-founder of a committee that works to educate public defenders about anti-racism efforts, both in the courtroom and the office. Both Antzoulatos and Medina devotedly protect the rights of marginalized individuals against unjust police practices and bias in the criminal legal system. 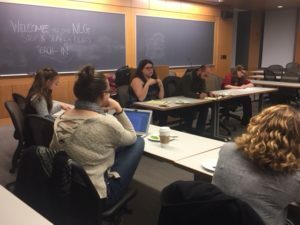 In the Stop & Search Rights For The People teach-in, Antzoulatos and Medina critically unpacked the history and impact of the Fourth Amendment. Since the elites of society wrote the Fourth Amendment (and the Constitution as a whole), it serves the agenda of preserving elite power. As such, the Fourth Amendment fails to provide substantive legal rights for ordinary people, let alone legal protection. There are so many exceptions and loopholes written into the Amendment that allow police and law enforcement to violate what should be protected by law, thus further oppressing marginalized communities. The Fourth Amendment, historically and currently, does not provide legally protected rights for marginalized individuals. It is difficult, then, for lawyers to represent people who suffer police misconduct in cases such as unwarranted frisking and house searches. 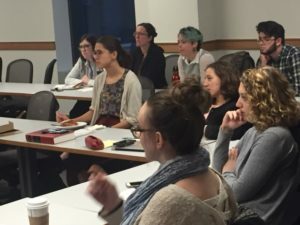 Attendees of the teach-in posed many important questions regarding what legal action a law professional could take in specific cases of police abuse.